First reading of the week with the Soprafino and I decided to ask a concrete question rather than go for a general advice spread. There has been some excited talk over on Aeclectic about a new Russian Lenormand deck. I rather like the look of it but am torn between the desire for a new deck and the realisation that I already have many decks – do I really need another one? Should I buy this new Russian Lenormand? I pulled 3 cards – one to represent me, one to represent this new deck and one to represent the interaction between us. This card, being a 5, represents one of the ‘marriage’ numbers. The pentad is at the centre of the Tetractys and is fluid, accommodating and flexible. This is just like me when it comes to new decks – my door is always open! The coins are also an obvious reference to money and indicate that I am willing to be flexible with my finances to purchase new decks. This is an interesting representation for this Lenormand deck. It looks like it might provide me with a wake-up call. This deck has the potential to give a fresh perspective on Lenormand and give that feeling of ‘rebirth’. It might also bring out judgemental tendencies – do I like the cardstock? Is it disappointing in the hands after seeing the scans? Will I like it more or less than my other lenormands? They are talking about this deck. 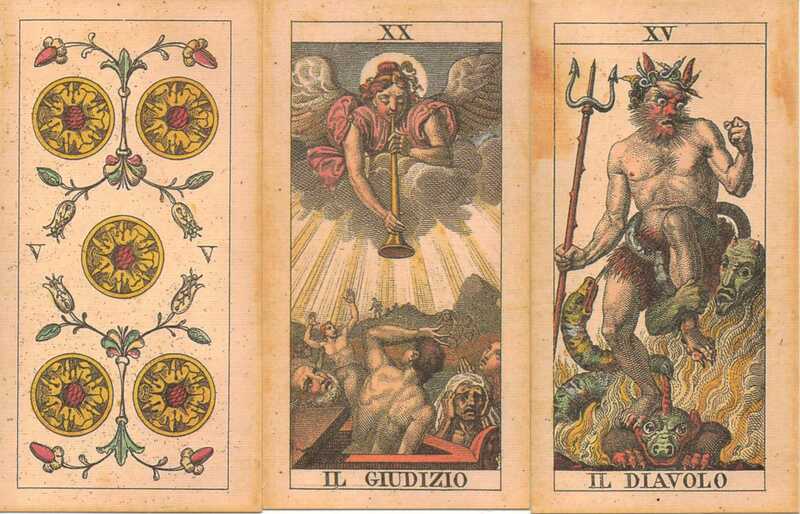 So funny that you did a reading on buying a deck, because I have been trying to decide whether to buy the Soprafino (or its cheaper cousin Classic Tarot). 😀 Are you using a set of meanings particular to this deck, or drawing from a system such as the Pythagorean. I’ve always been in awe of those who read well with this type of deck! The Soprafino is well worth it if you can stretch to it. I have the Ancient Italian which is similar to the Classic but with different borders. I would love to know about the difference between Ancient Italian and Meneghello’s Soprafino. Are there any? I read these were the same cards by different producers, with minimal differences. Is my information correct or not? And I would love to see the backsides, but can’t seem to find them anywhere. Do you have a scan of those, perhaps? I would be most grateful for an answer… it’s my birthday soon and I’m trying to figure out which one to get 🙂 Thanks in advance! Thank you for stopping by. 🙂 The Ancient Italian and the Il Meneghello Soprafino are essentially the same deck. The images are the same but the colouring is slightly different. I have both decks and love the Meneghello for its antique look and cardstock. I’ve contacted Il Meneghello and they can ship it to my doors for peanuts, whereas Lo Scarabeo had crazy shipping costs for my country! Or I would have to travel to the nearest city to find it since I live in a small village, middle of nowhere. So if there is no difference between their backsides — don’t know why, but I’m a sucker for good back art — I’ll rather go with the Meneghello’s Soprafino. They just arrived yesterday! Yay! Although they are a bit smaller than expected, I am impressed by how well-made they seem. I thought it would be difficult shuffling unlaminated cards, but they slide so well in my hands, and I am over the moon to have them! I am still a bit shy to try any readings, so am simply looking at them and enjoying the art, and the feel. Which sources do you use for reading with the soprafino? Or do you combine several? In terms of reading methods, I use a bit of a mixture. When I started trying to read with decks like this, I went to the TdM forum on Aeclectic Tarot. I’d highly recommend a visit there as lots of different methods get discussed so you can find one which suits you.